There is nothing quite like a fireplace to make a room feel cozy and comfortable during a cold winter night. Imagine relaxing with your family as the snow quietly falls outside the window, warmed by the dancing flames of your own fireplace. Years ago, fireplace owners had to deal with stacks of natural firewood taking up space in a garage, shed or yard to fuel their fireplace. But thanks to modern gas fireplaces, homeowners can ignite their fireplace with the simple flip of a switch, rather hauling rotten, bug-infested logs into their home. Master Plumbing & Mechanical can install gas fireplaces, as well as the requisite gas piping, to give your home hours of warmth and pleasant atmosphere. A gas fireplace offers all of the warmth and aesthetics of an actual wood-burning fireplace with none of the drawbacks. They incorporate artificial but authentic looking logs to obscure the gas vents. Because a gas fireplace is sealed behind airtight glass, the only exchange of air is the outside air being drawn into the home to allow combustion; no warm air escapes the home through a gas fireplace. In new construction, a gas fireplace can be installed very easily and cost efficiently because it does not require a brick hearth or chimney. In homes with existing fireplaces, a gas fireplace insert can be installed into the previous fireplace construction. Many gas fireplaces even include a remote control for convenient operation. A gas fireplace will easily become the focal point of a living room, even drawing eyes away from the television. More than aesthetically pleasing, gas fireplaces offer many practical benefits. Though a gas fireplace may not be as important to a home’s functionality as the central heating and air conditioning unit, or a water heater, it can become a cost efficient way to make a living room even more comfortable and attractive. A gas fireplace can lower heating costs if the thermostat is turned down while home occupants are in the living room with the fireplace. In a traditional fireplace, the fire and warmth end when the supply of logs runs out. 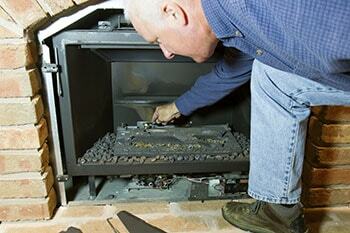 In a gas fireplace, the fire never has to stop and no one has to tip toe out into the cold to get more wood. Gas fireplaces are also incredibly safe, energy efficient and easy to use. Real Fyre, a Peterson company, has been a leader in the gas fireplace industry for more than 65 years. Real Fyre gas fireplaces are so efficient and authentic looking, you won’t be able to tell that it isn’t a real fireplace until you realize that it doesn’t need more logs to continue producing beautiful, warm flames. Master Plumbing & Mechanical services the Washington, D.C. metropolitan area. If you’re looking to upgrade your fireplace to natural gas, contact us for a consultation.